The $3.1 billion Washington wants to lavish on these highways would be more than enough to fix every structurally deficient bridge in the state. Washington plans to spend billions on the Puget Sound Gateway project to “relieve congestion,” but if anything the project will increase it. Furthermore, it is planned for an area where traffic has been stagnant for more than a decade, and where other transportation needs are clamoring for attention. The Washington Department of Transportation (WSDOT) has proposed construction of a $2.8 billion to $3.1 billion project between Seattle and Tacoma: expanding State Route 167 between Tacoma and Puyallup by two lanes and State Route 509 from Kent to Burien by two lanes. Also proposed is adding two new express lanes to Interstate 5 between the ports of Tacoma and Seattle, which could be used by drivers willing to pay for an expedited trip through the new lanes. Toll revenue would only contribute $330 million toward the total cost of the project from the time it is completed in 2021 until 2060. WSDOT has already warned that more than a billion dollars in additional state borrowing will likely be needed to cover the project’s costs. 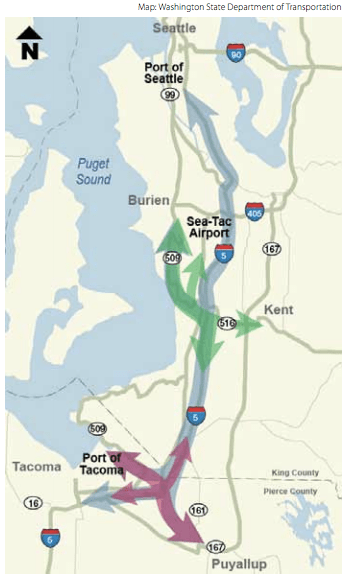 Justification for the project relies on claims by WSDOT that expanding routes 167 and 509 will bolster Washington’s export economy by increasing the ease and efficiency of the transport of commercial goods along the routes and to the ports. WSDOT also claims the project would reduce congestion through the region. But the state’s own data show that building the project would substantially increase traffic on I-5, inducing cars and trucks to drive nearly 2 million more miles a year on the highway by 2030, and drivers to spend more than 25,000 hours behind the wheel on I-5 in that year than if the project was not built. 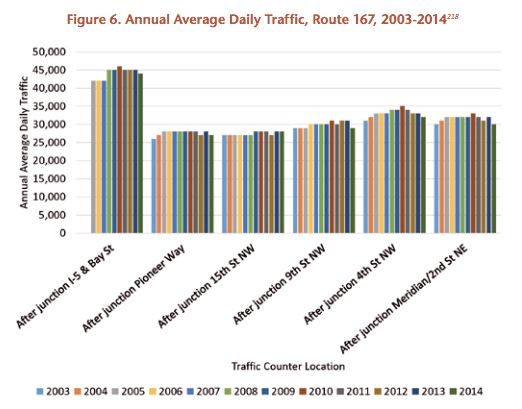 In addition, traffic on routes 167 and 509 remained stagnant between 2003 and 2014. During that same period, I-5 saw as many locations with stagnant or decreasing traffic as with increasing traffic. WSDOT is an agency with a long history of very costly, often unnecessary, highway construction projects. Other project supporters include real estate developers hoping the expanded road will encourage sprawl, including in a 4,000-acre, 5,900-suburban home development under way in the region. Properly directed investment in Washington’s transportation system is badly needed, and the billions being proposed for the Puget Sound Gateway would find very productive uses if they were available for other purposes instead. For example, to fully replace all of the structurally deficient bridges in Washington would cost $1.2 billion — far less than the Gateway project. Repairing them to good condition without rebuilding them would cost $847 million. The Gateway funding — or even what is left of it after fixing all of the state’s structurally deficient bridges — could also provide a significant boost to transit service in the Puget Sound region. The local transit agency, Sound Transit, is developing a $15 billion proposal that, if approved by voters in 2016, would increase local taxes to pay for significant investment in the Puget Sound regional transit system. Adding state and federal funds from the Gateway project could either allow additional service improvements or relieve pressure on local taxpayers. Further highlighting these “Boondoggles” from the PIRG report have been great. Please please please highlight the one in New Mexico…Paseo del Volcan. Five hundred families will lose their homes to this grossly unjust $1.5 billion highway boondoggle.